1. 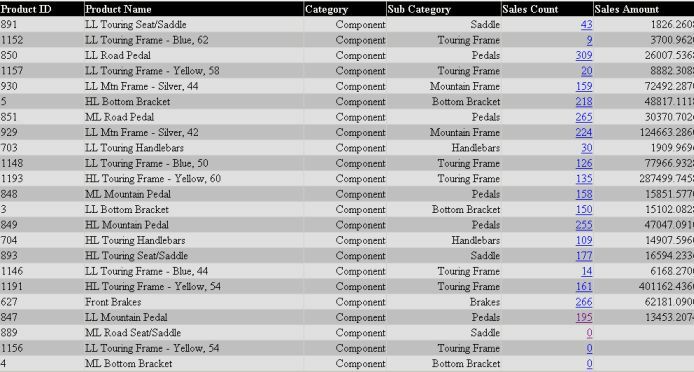 Change the background color and font color of all rows where the Sales Amount is > 100,000. The ItemDatabound event is a perfect place to makes last minute changes to the Datagrid. This event is raised after an item is bound to the Datagrid control but before it displays. This makes the event a perfect place to apply conditional logic to change the style or formatting of an item based on the item’s values. To understand the ItemDataBound event within the context of a Datagrid – this event fires each time a row (item) is bound to the grid. The first thing we need to do is create an event handler for ItemDataBound. The first parameter passed to this event handler, is an object type, in this case the object is datagrid. The second parameter is a DataGridItemEventArgs type. 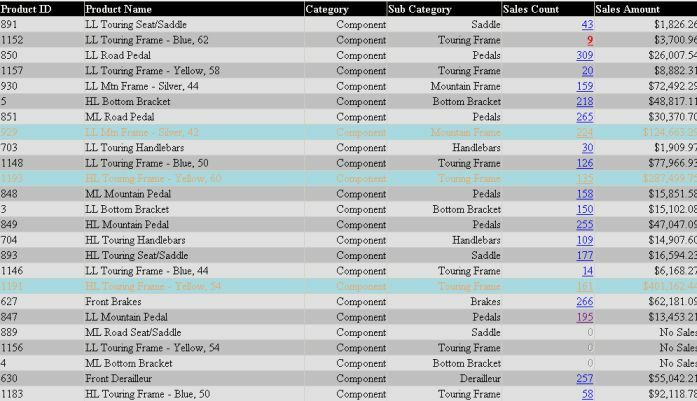 This parameter encapsulates information about each item (row) after the data is bound to the datagrid. We have seen that the ItemDataBound event fires for each row in the Datagrid. By verifying that the ItemType is either Item or Alternating item we have eliminated applying the subsequent procedural logic to all but the data rows. In web applications, real estate (the available area on screen to display information) is often at a premium. In this little example we want to display the Product Model Name as well, but have no space in which to display it. One solution might be to display it as a mouse over event when the cursor hovers over the Product Name. There is a Tooltip class (http://msdn.microsoft.com/library/default.asp?url=/library/en-us/cpref/html/frlrfsystemwindowsformstooltipclasstopic.asp) available to us which will display a small pop-up window when the mouse hovers over a control. Our first step is to add the Product Model Name column to our grid, and since we don’t want it displayed as a column, set its visibility to false. Now when your mouse hovers over the Product Name cell, the Product Model Name will appear over it. Datagrid objects often use button columns, which when you click on will navigate to a more detailed version of the data. In this example we have a Sales count column which returns the number of Sales which meet a certain criteria. There are some rows which return 0 – and so there is no detail information to navigate to. In this case we want to suppress a user’s ability to click on this column. While building the grid in our aspx page, we did not specify the display format for the Sales Amount column. The reason for this was, the stored procedure returns either a numeric amount field or a null value. When it returned a null value we were going to change it to a string as demonstrated in the last example. It then becomes necessary to set the display format at run time based on the value of the Sales Amount column for each row. Fortunately for us, this is quite simple. Let’s compile and run our example and look at what we get. The above datagrid is certainly not the prettiest ASP.Net datagrid there is, but the idea was to demonstrate how properties of datagrid cells can be changed at run time based on their values. The examples listed in this sample is not a comprehensive list of all the attributes that can be changed, rather then a collection of what seem to be the most frequently asked for.